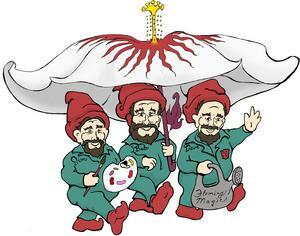 Jim, Bob and Dave Fleming couldn't have seemed more like real living gnomes with their short stature just above 5 feet, their carefully crafted goatees, wide brimmed hats, coveralls, ornery smiles and their magical hybridizing talents. They became world-renowned plant breeders not only because they hybridized thousands of Popular Decorative Mums, Dwarf Crepe Myrtle and other perennial standards but also for their Signature Giant-flowered Hibiscus with purple and red leaves, lavender and yellow flowers, and compact stature (not unlike their own). These inventions were achievements previously thought unattainable in the species. For over 60 years, they bred tropical-looking perennial plants all hardy to -30 degrees Fahrenheit having the ability to withstand drought and extremes way before people understood the need for sustainable horticulture. Making them available to more zones of the country. The Brothers grew up in Nebraska with their engineer Father and trailblazing Mother, who as the State Naturalist helped create the vast and beautiful state parks filled with multitudes of specifically selected native trees. The parents' large back yard in Omaha NE is where the kids education into hardy flowering plants, sold as cut flowers, began. The bros rode the bus to Lincoln with giant football Mums that the boys took to the Nebraska "Bugeater" (Husker) Games in the 20s and 30s and sold as corsages with pipe cleaner 'N's atop the snowball flowers. Bestowing the delight that flowers bring was now etched into the boys' psyches forever. Their Horticultural second site naturally grew and flourished as Jim gained PHDs in Botany, Plant Pathology and Genetics, Bob a Master's in Botany and Dave a Master's in Engineering. The seed of Fleming’s Flower Fields was being firmly planted but was interrupted by Jim and Bob volunteering for WWII. The compact but hardy Fleming Brothers proved to have the strongest hearts, surviving Omaha Beach in WWII and rebuilding countries after the war, coming back and not only creating flowers to uplift the world and dedicating their lives to the happiness of their customers above any financial gain and that's what, above all, were their greatest gnome-like qualities. In the 60s Jim, the oldest, rocketed Fleming's Flowers into the hortisphere with a revolutionary new winter hardy Mod Carnation that was single petaled with 2 distinct white spots on each petal and it was named "Spotty" inspired by the Dianthus he saw in English gardens after the war...and it was such a revelation that it spurred an entire industy of hardy Carntation that are still flourishing today. Jim, a sargeant in WWII and Professor at the University of Nebraska was a benevolent leader that inspired greatness..
Bob the gentleman, middle brother, kept Flemings Flowers growing gracingfully and along with Jim, wrote the eloquent catalogues that represented the Fleming mail order offerings for over 60 years. Bob was also the photographer and readily threatened to "shoot you with the Canon". His photos filled their catalogs and popular garden magazines and newspaper articles alike through the years. He, like Jim and Dave loved black humor and enjoyed nothing better than a Peter Sellers movie at the end of a long day of gardening. Bob's claim to fame was the earthshaking dwarf and hardy Crepe Myrtlette of only 3 foot that spiralled gracefully while effortlessly balancing giant mounds of crepey flowers in white, pink, lavendar and red; hardy to -30 Fahrenheit! Again a whole industy was spurred that just can't quite replicate the beauty or hardiness of the Fleming Filligree Dwarf Crapemyrtle masterpiece. Dave was the youngest and Jim referred to him as the "Hibiscus King". An engineer by trade, he was taught breeding and horticulture by the best and became the most driven in regards to believing in and creating a New Hibiscus hardy to -30 Fahrenheit, only 4 foot instead of the 6-8 foot plants of the past with new flower color breaks of lavendar and yellow Giant 12" Corollas. The refined compact purple and red Maple shaped leaves framed the masterworks with their fantastical flowers. When Dave wasn't bowling a 300, he was working on his Hibiscus, designing and mimeographing the catalogs or delivering plants to local nurseries with a big smile.. The Brothers, who left their gnomish genes in their many flowering plants, dreamt that Fleming's Flower Fields would continue the way they envisioned with their name on their creations, so we began naming and patenting the plants ourselves along with licensing a number of quality growers to handle the burgeoning hibiscus industry they single-handedly created to secure the Fleming Hybrids into the future. We strive not only to follow their ethical business example but to also to honor them in every way possible as we keep breeding the most unique plants possible just the way they taught us over our many special years together...They never thought of taking advantage of any one or any other breeder for their own gain and we hope we have helped secure their ethical legacy so others can remember these American heroes of flower power. We hope our Flower Hybrids and new handcrafted products like the Gnomes we have such an affinity for honor the Fleming’s legacy of fabulous flower breeding and of help uplift our customers the way they did theirs.